I know, I know...I've created a whole blog dedicated to me wearing heels but it was time to give my feet a break. I have never been a big sneaker person. I always felt awkward in them, I felt as if my feet were constantly sticking out. I decided to try slip on sneakers for those days I need to run a lot of errands or will be spending a long time outside. Also, my commute from the train to my office is longer now so I need to be safe and comfortable. I found these Aerosoles sneakers and I am in love. They are extremely comfortable and I can pair them with my casual and work attire. There have been days that I will put them on to step out for lunch and end up keeping them on for the rest of my work day because they are so comfortable. For this past gorgeous fall Saturday, I wore these slip on sneakers with neutral colors. 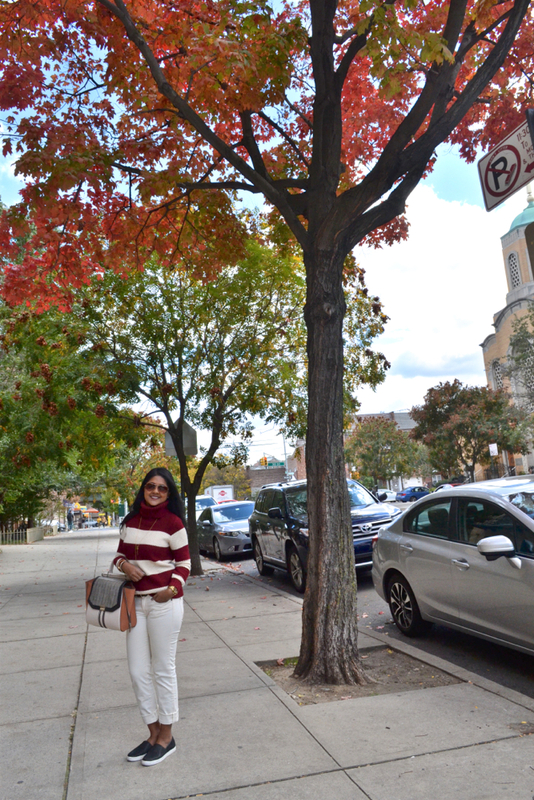 I wore my cream colored 7 Jeans and a matching sweater I picked up in Shanghai a few years ago. This BCBG purse was given to me from a good friend of mine. It is the perfect size for running around town. Simple gold accents including this necklace from my Rockbox complete my outfit.